Sandra Lockhart, Director of The Branches, spoke to the attendees at the AHLOA monthly meeting this morning at the Avalon Senior Center about the tremendous service being provided by the 100% volunteer organization. The Branches, located in the Village Shoppes in Rio Grande, is an outreach ministry of St. Mary's Episcopal Church, Stone Harbor, operating in collaboration with area churches and organizations. The Branches provides a safe, positive environment for the elderly, disabled, homeless, and individuals or families living in poverty. 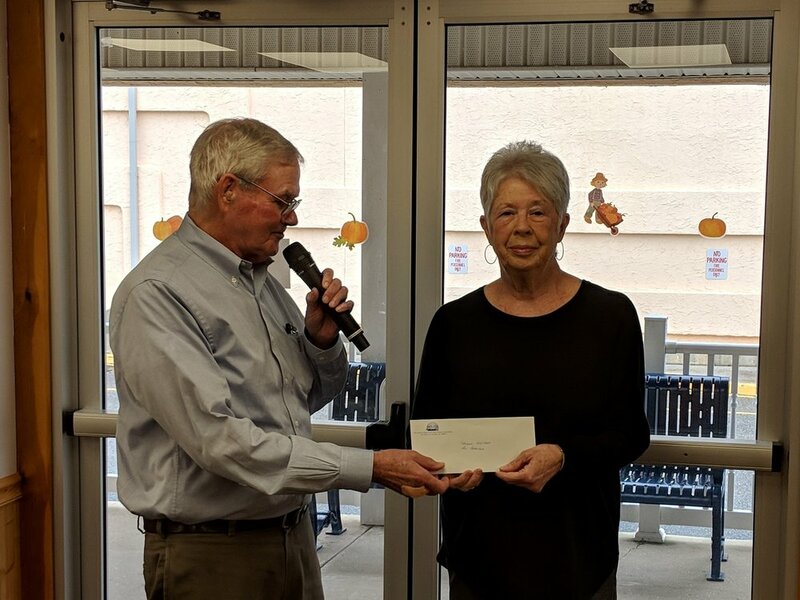 Pictured below at today’s meeting, Jack Keenan, President of AHLOA presented a $500.00 contribution through Sandra to The Branches on behalf of AHLOA members. For more information on how you or your organization can help or contribute to the mission of The Branches, please call Sandra Lockhart, Director at 609-886-5091. Their Facebook page, The Branches Outreach Center of Rio Grande, is a good way of keeping up with their activities and needs. Links to their website and Facebook page are included below.